I've always wanted to get a tattoo, but almost always have problems with coming with a design that's "meaningful" to me. By the time I finally settle on something I think will be a good choice, I end up losing all enthusiasm for it and think of another image that'll "speak" to me, and the whole cycle continues all over again. Maybe one day in the future I'll come up with a design I like. I shouldn't feel too bad about it though, because one of the most likable actors of all time, Michael J. Fox, didn't get his first tattoo until he was 57 years old, and the story behind the design he chose is absolutely adorable. So there's a good chance he won't regret the ink on his body, unlike these people, I'd imagine. If you're not familiar with Michael J. Fox, his story is an incredible one. He was born in Edmonton, Alberta, Canada in 1961 and grew up wanting to be a professional hockey player. I'd imagine that's a passion for lots of young Canadians growing up. It wasn't long for him to discover that his real calling was to become an actor, and he did. He starred in some huge films, most notably the Back to the Future trilogy. He landed the movie after a string of consistent TV roles, including Alex P. Keaton on Family Ties, and went on to become a box office star. He appeared in comedies like Teen Wolf and Doc Hollywood, but did an awesome job playing opposite Sean Penn in Brian DePalma's Casualties of War. 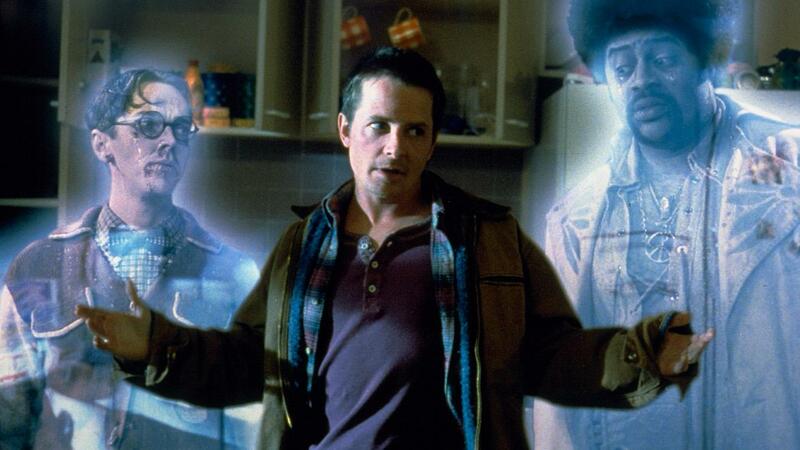 Oh, and there was a little wonderfully underrated Peter Jackson film, The Frighteners, which is easily the best ghost-comedy movie (that's actually scary in some parts) after Ghostbusters. Michael also starred in the long-running TV sitcom Spin City, which aired some five years after he was diagnosed with Parkinson's. At the height of his career, and at only 29 years old, Fox found himself suffering from the disease, and he kept it a close secret until he finally disclosed it to the public in 1998. In the year 2000, he briefly stopped acting in order to tend to his illness, but throughout the years he has still maintained an impressive body of work in film, TV, and voiceover. He founded the Michael J. Fox Foundation, which is dedicated to Parkinson's research, and the work he's done has advanced studies in the disease and brought a huge amount of attention and awareness to it. In an episode of Curb Your Enthusiasm, Michael famously plays himself and displays a hilarious sense of humor about his condition. It's a fan-favorite episode of the series. Michael's life for a long time has been dedicated to helping others, which probably played a big part in why his new tattoo carries so much meaning. 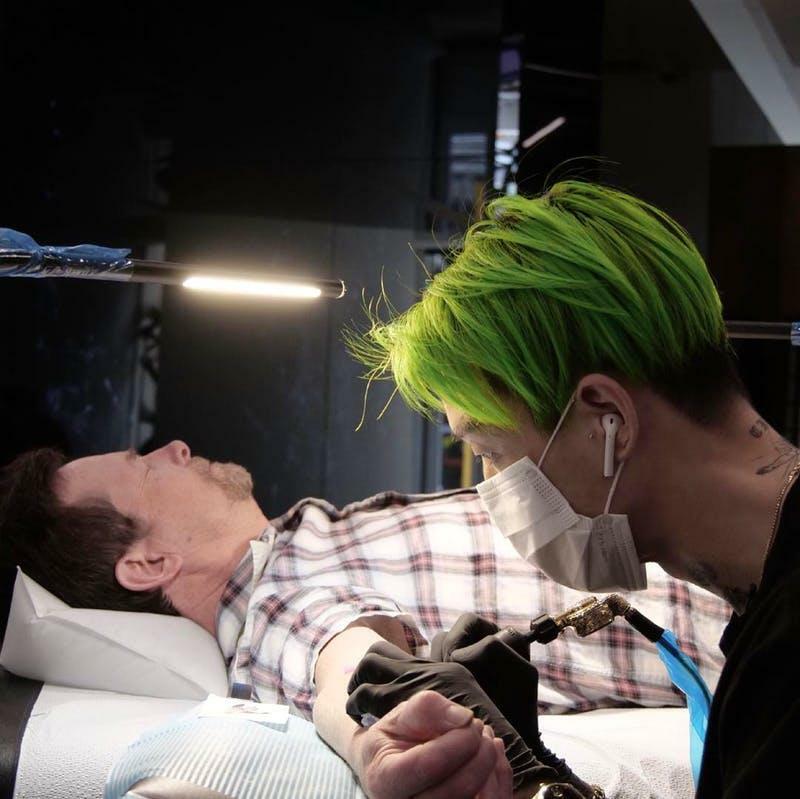 This year, he visited the Bang Bang tattoo parlor in New York City and sought out the services of Mr. K, a seriously talented tattoo artist. 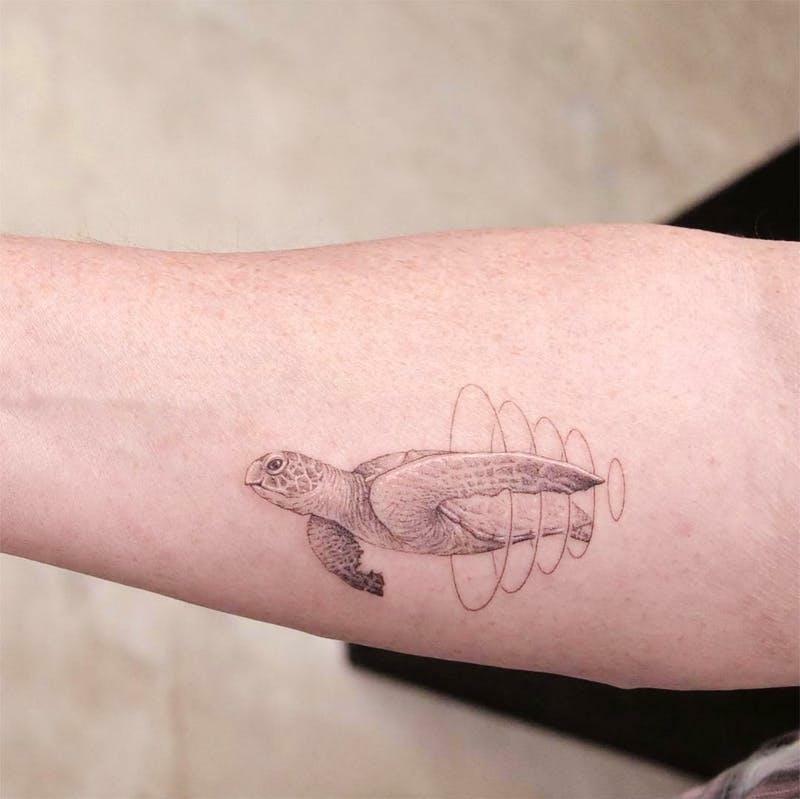 This cool sea turtle, who appears to be traveling through some trippy space portals. If you look closely at the photograph, you'll notice that the turtle's missing a chunk from his fin. 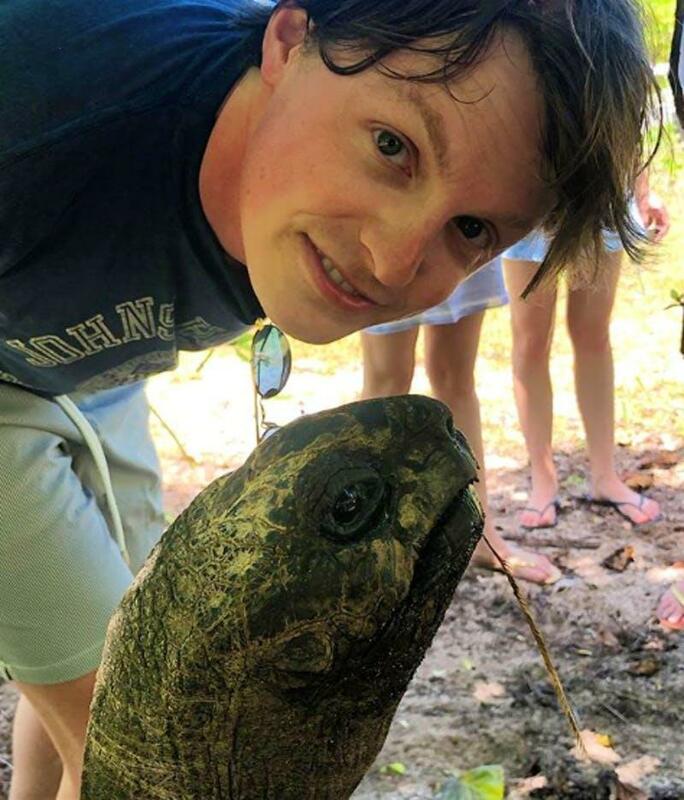 It turns out that the shelled friend was based on a real-life sea turtle Michael came across while swimming in St. John. Just like the turtle in his tattoo, the real one Fox met had a messed-up fin and a scar on his face. Fox says that the turtle let Fox swim with him for about 30 minutes but soon did something the actor described as "transcending." He didn't go into further details about that, but the experience was so powerful, it stayed with Fox for a very long time and ultimately influenced how he went about his career. Now, years later, he decided to get a tattoo about the incident. That's some turtle. 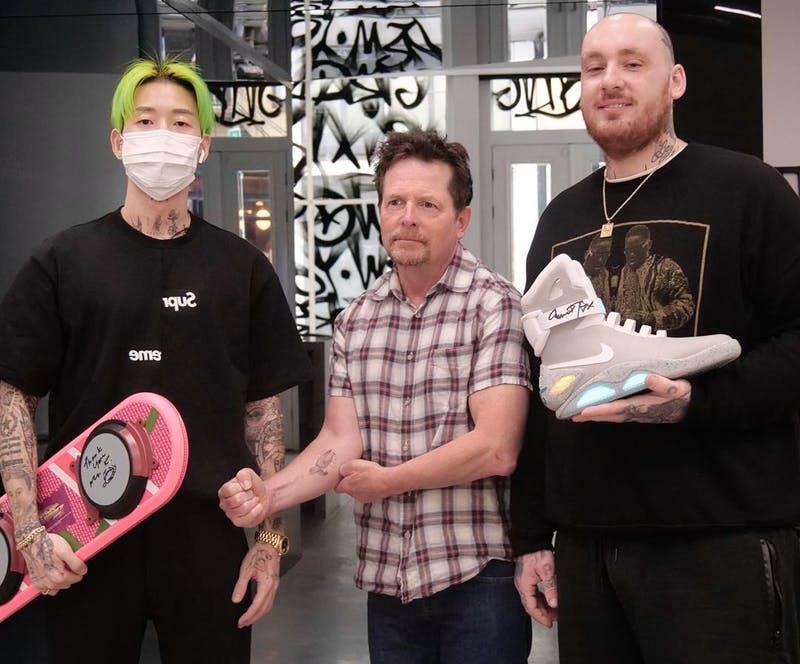 In addition to letting the folks at Bang Bang take photos of him and his tattoo, Fox also brought them some gifts that fans of Back II the Future will recognize immediately: a Hoverboard prop and his futuristic high-tops from the movie, the Nike Mag. The limited release, self-lacing shoes from the film were released for public consumption in 2016. 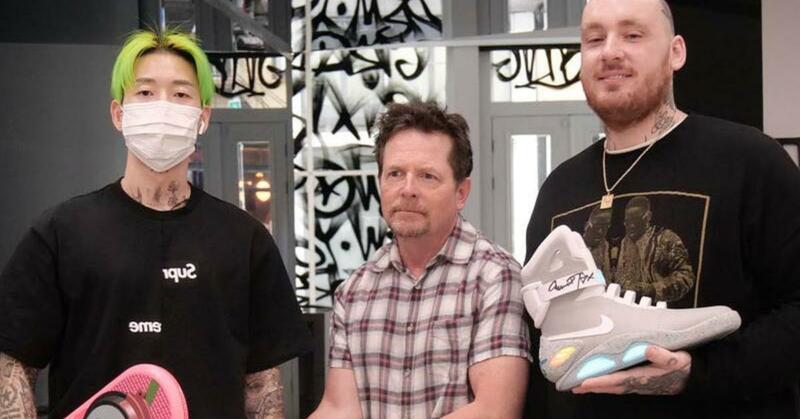 The kicks do lace themselves and helped raise a whopping $6.75 million when sneakerheads all over the world copped themselves some pairs. Other celebrities have also decked themselves out in memorable ink. 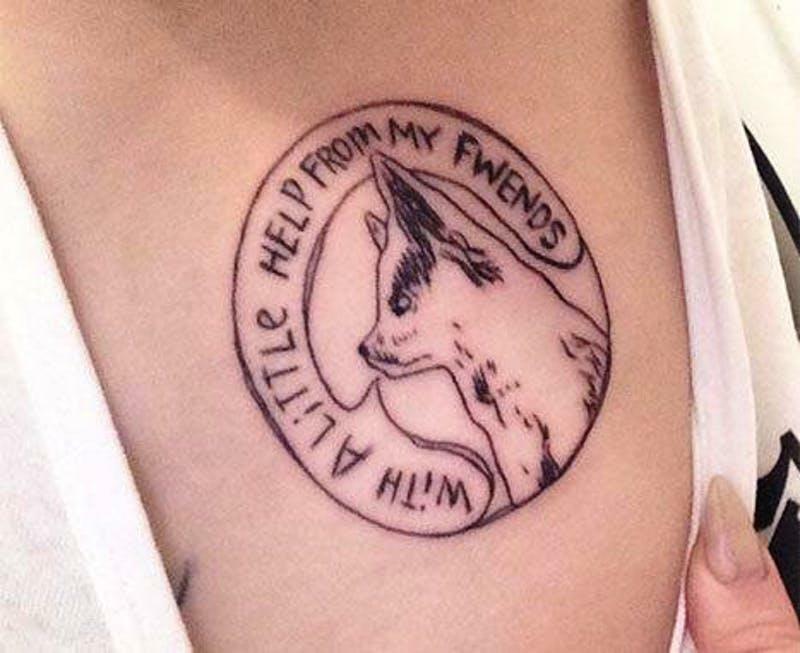 Miley Cyrus, a huge animal activist, got this tattoo as an homage to the furry pals she fights to help protect. 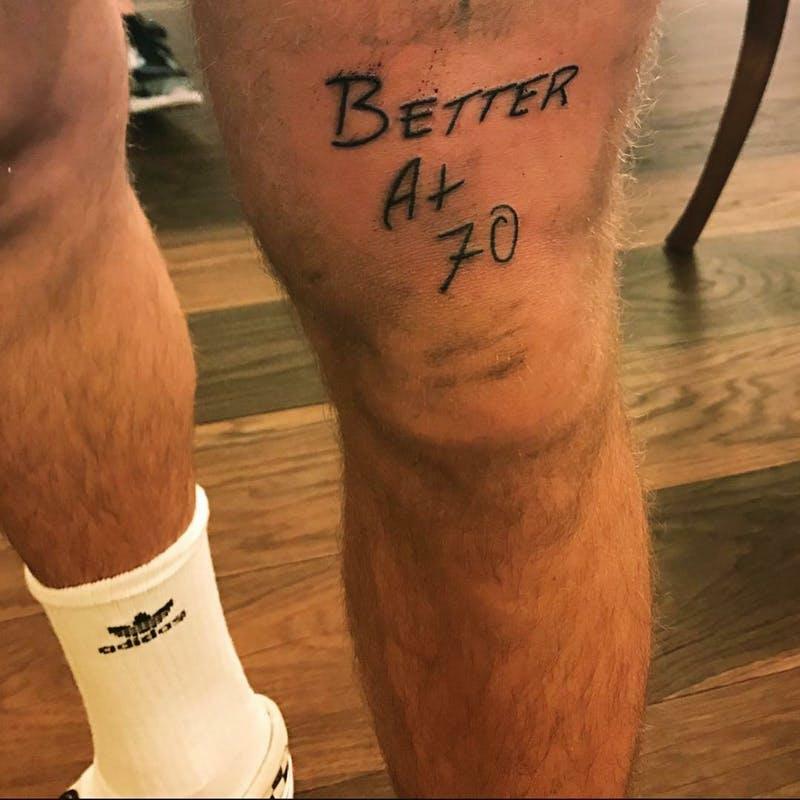 Justin Bieber also has a tattoo that contains a hopeful message for his future self: to be better at 70 years of age. Ambitious, and touching. 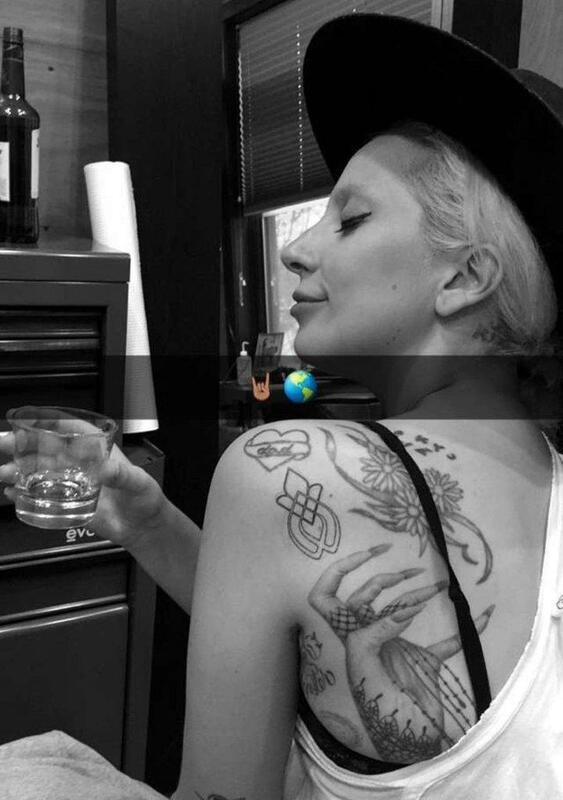 Lady Gaga rocked a joint tattoo that was specifically designed as a symbol of support for survivors of sexual assault. During her performance of "Till it Happens to You" at the 2016 Oscars, Gaga was joined on stage by sexual assault victims, who got inked with the same tattoo as the singer. It combines the imagery of the Gaga's favorite flower, a white rose, along with the infinity sign, and a flame to symbolize unity. 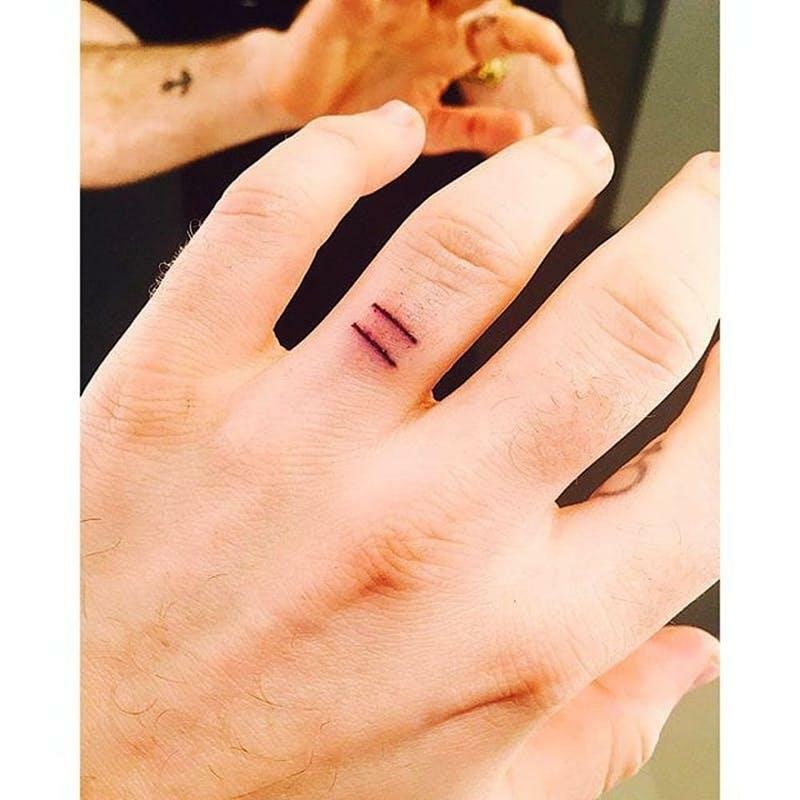 Sam Smith didn't get a tattoo per se, he etched an equality symbol on his ring finger with a ring to signify the struggle for gay marriage and LGBTQ rights. There's also Nic Cage's Inside the Actor's Studio episode where he mentions that he got a tattoo of a lizard wearing a top hat. He didn't really go into the story of it, but I do know that I really want to see that design.